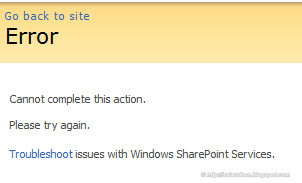 Another fine evening, SCOM reported an IO issue in SQL Server box where SharePoint DBs residing. At the same time, End-users started getting errors: "Cannot complete this action. Please Try again." Last modified time: 3/21/2012 7:20:55 PM Alert description: SQL Server detected a logical consistency-based I/O error: incorrect checksum (expected: 0x4c2c50d1; actual: 0x4c6650b5). It occurred during a read of page (1:2505989) in database ID 25 at offset 0x000004c7a0a000 in file 'S:\Microsoft SQL Server\MSSQL.1\MSSQL\Data\WSS_Content.mdf'. Additional messages in the SQL Server error log or system event log may provide more detail. This is a severe error condition that threatens database integrity and must be corrected immediately. Complete a full database consistency check (DBCC CHECKDB). This error can be caused by many factors; for more information, see SQL Server Books Online. stsadm -o databaserepair -url http://site-coll-url -databasename "Content_Database_Name"
Nope, It didn’t Help, it returned the same error. luckily it fixed the issue. again. This time, no issues. we are done. Same kind of issue happened recently with PAGE error. Tried Repair, Allow data Loss, But none worked. Seriously you are so lucky because you have recovered your whole database by using repair_allow_data_loss with DBCC CHECKDB. As I know that DBCC CHECKDB with repair_allow_data_loss tries to repair corrupt database with minimum data loss. You may loss some amount of data. Sharing this with you because I am not lucky as you, I had used third party sql restore tool to recover complete data. DBCC CheckDB will show you which tables have issues and whether that can be fixed. If you are not able to access db at all then you can restore the latest db backup too and try to see how SharePoint accepts that or you can try Sharepoint Recovery software to quickly fix the database corruption.